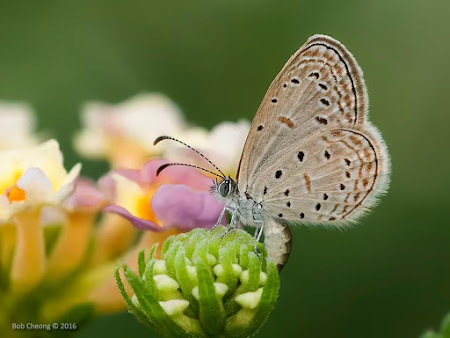 In Part 6 of our discussion on Common Names of Butterflies in the Southeast Asian region, we continue with the remaining species in the Lycaenidae family for which recent references had updated or amended the English common names of these species. As in the earlier parts of this series, the primary reference that made significant changes to the common names is the book by Dr Kirton. After writing the earlier parts, it is interesting to note that even with the rationalisation of certain common names, the regular usage of names in cyberspace and social media appears to take precedence over any printed literature. Once a name is coined and repeated through frequent usage and cross-referencing across the internet, these names are difficult to change. In any case, we continue our discussion on some of these changes proposed by Dr Kirton in his book, Butterflies of Peninsular Malaysia, Singapore and Thailand. 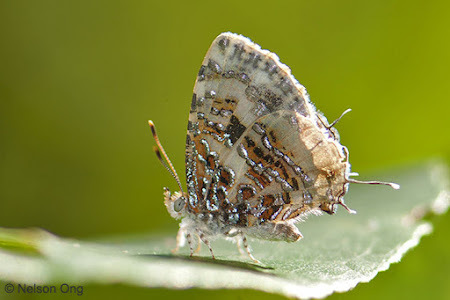 The first species that we will discuss in this article is Zizula hylax pygmaea. Across the hardcopy references in the region, most books refer to it as the Tiny Grass Blue. 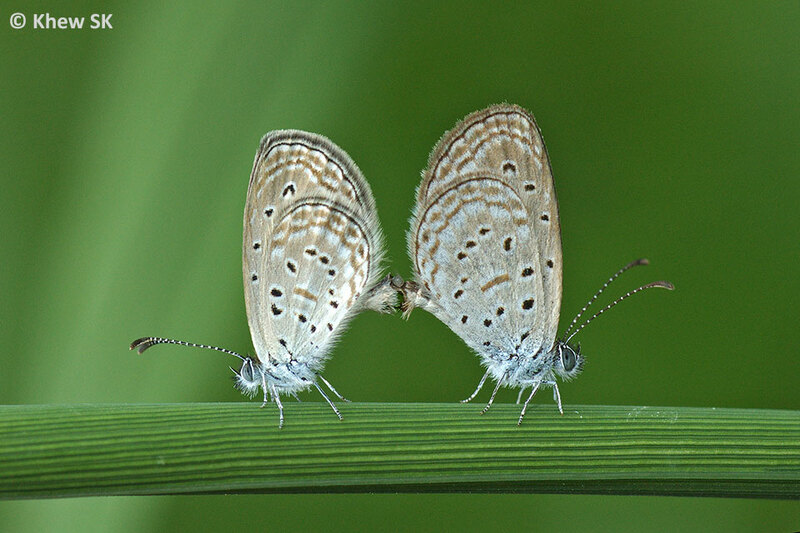 However, the common name Pygmy Grass Blue has more frequently been used in the Singapore context and the name appears to have been adopted by common usage in the local references. Perhaps it may be apt to use the name for subspecies pygmaea (where the common name makes sense when reference is made to the latin scientific name, for obvious reasons). 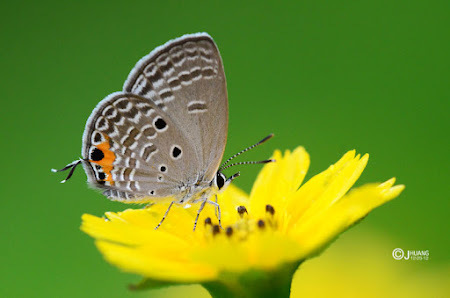 Recommendation : Zizula hylax pygmaea should retain its common name Pygmy Grass Blue but may also be simultaneously referred to as Tiny Grass Blue (Zizula hylax hylax) and its various subspecies in the Asian region. The next species, Chilades pandava pandava, is a common urban species whose caterpillar feeds on the Sago Palm (Cycas revoluta) and several other Cycas spp. (commonly referred to as Cycads). 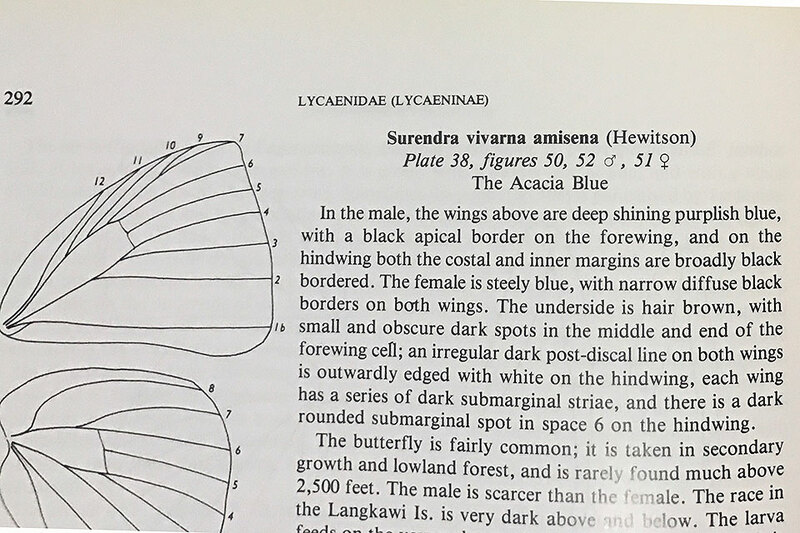 It is no wonder that the name Cycad Blue was coined by Prof Yong Hoi-sen in his book, Malaysian Butterflies - An Introduction, back in 1983. 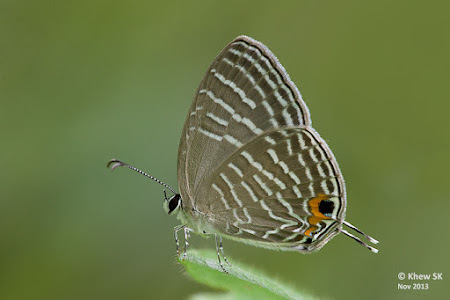 Elsewhere in the region, most references refer to this species as Plains Cupid. 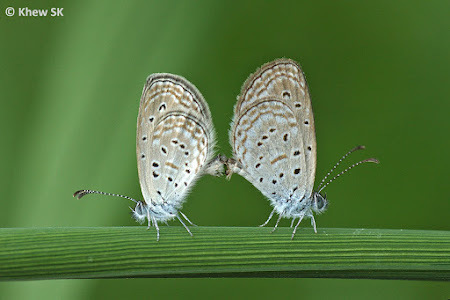 In another Singapore reference, A Guide to Common Butterflies of Singapore, the author Steven Neo also referred to this species as Cycad Blue. In reference websites in the region, both names are used interchangeably in social media and other digital media. 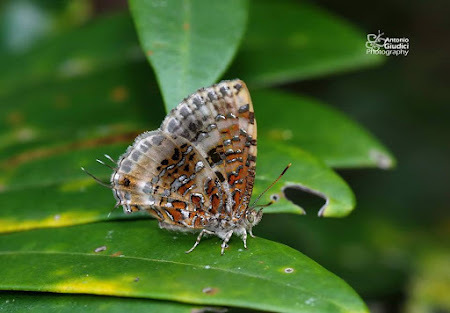 Recommendation : Chilades pandava pandava is referred to by its common names Cycad Blue and Plains Cupid interchangeably, and there is no preference for either name through common usage, and time will tell which becomes the adopted name in this region. The next group of butterflies under the Jamides genus comes under scrutiny. The common name that varies amongst different literature is how the name "Cerulean" is spelt. Some references show "Cerulean" whilst others show "Caerulean". Upon checking different sources, the spelling is correct in both cases. Wikipedia references state that Cerulean and Caerulean are both correct, and the word refers to a colour with the hue ranging between blue and cyan. The etymology of "Cerulean/Caerulean" originates from the Latin word caeruleus, "dark blue, blue, or blue-green", which in turn probably derives from caerulum, diminutive of caelum, "heaven, sky". 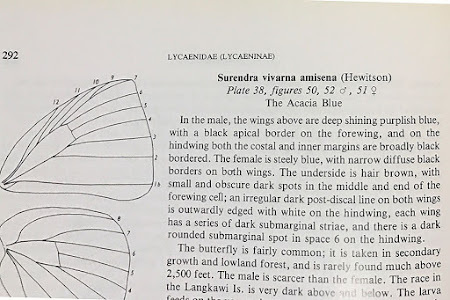 Malaysian Butterflies - An Introduction (1983) by Prof Yong Hoi-sen uses "Caerulean" to refer to the Jamides spp. 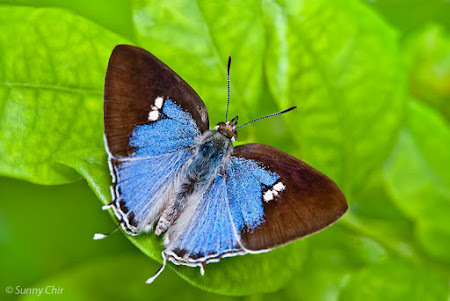 Again, in Prof Yong's book in 1983, he spelt the name of these butterflies as "Caerulean". In Corbet and Pendlebury's Butterflies of the Malay Peninsula, the spelling "Caerulean" is adopted. Elsewhere in the region, Cerulean is more commonly used. 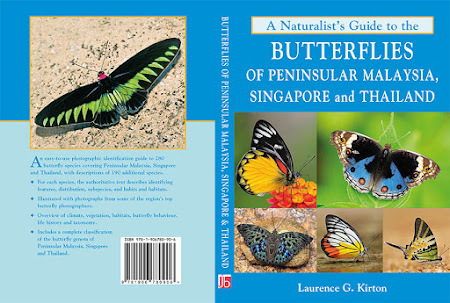 In both editions of Butterflies of Singapore, I used "Caerulean". Both names are also found in digital media across many websites, social media and online references and apps. Recommendation : The Jamides species' common names can be referred to as Cerulean or Caerulean as both spellings are deemed acceptable, and it depends on how individuals prefer to use it. 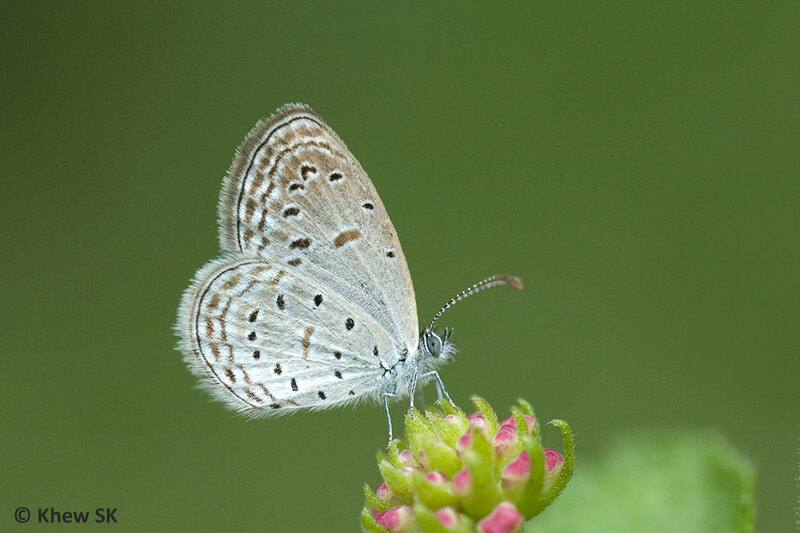 In Pisuth's Butterflies of Thailand 2nd Edition, he coined the name Green-scaled Acacia Blue for the species Surendra vivarna amisena. 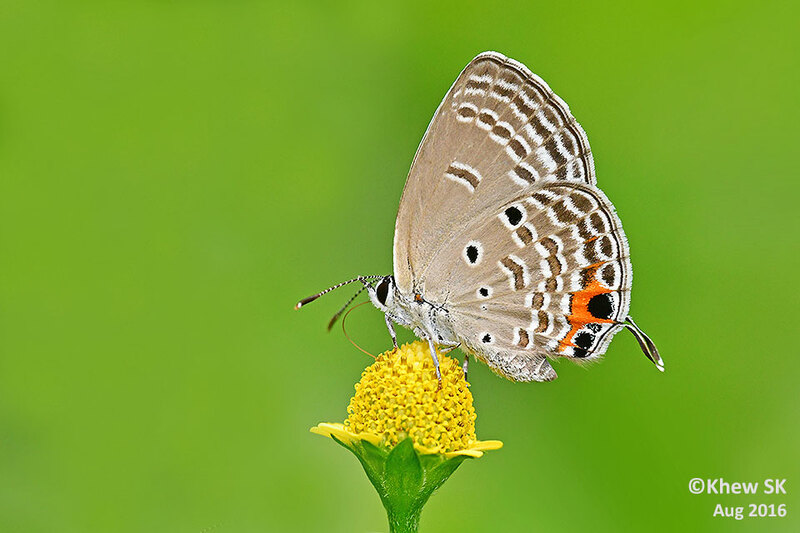 In Dr Kirton's book, he calls it the Burmese Acacia Blue. Local references in Singapore refer to this species as just the Acacia Blue. 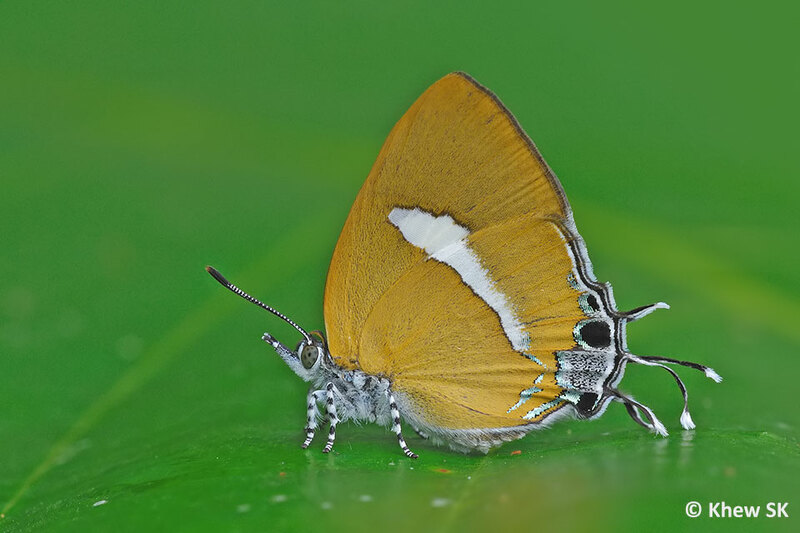 It is obvious that in the region, there are other species of the genus Surendra, hence prompting authors to coin names for the different species to differentiate them. Corbet and Pendlebury refers to Surendra vivarna amisena as "Acacia Blue". In Singapore, there is only a single species of the genus, and hence there is unlikely to be any confusion to refer to Surendra vivarna amisena as Acacia Blue. Recommendation : Surendra vivarna amisena should retain its common name as just Acacia Blue. The next species of interest is Iraota rochana boswelliana. Most references in the region use the common name "Scarce Silverstreak Blue" for this species. 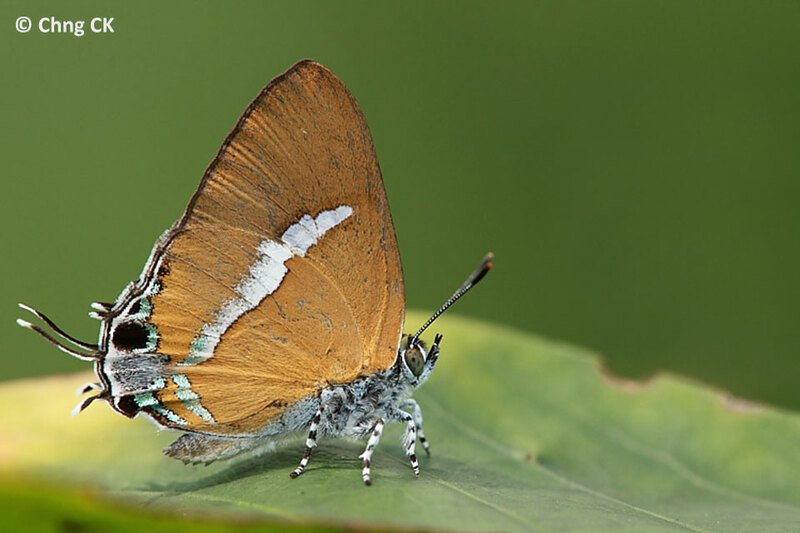 The Singapore references dropped the "Blue" in the name, and through common usage, it has often been referred to as only Scarce Silverstreak. 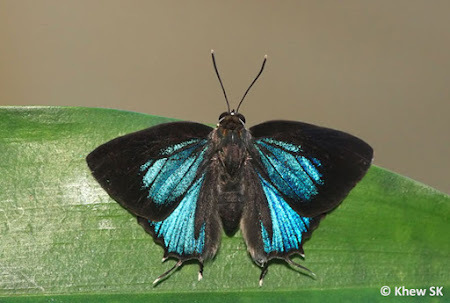 The other species found in Singapore (and only 1 sighting has been confirmed in the past 20 years), is Iraota distanti distanti. This species, which was referred to as the Spotted Silverstreak, also omitted the "Blue" from its name. 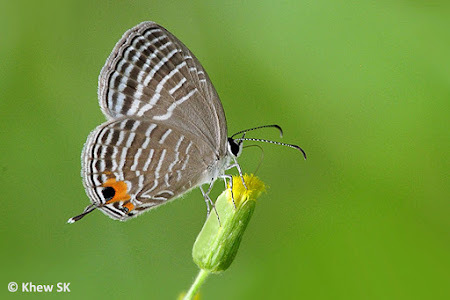 In Thailand, this species is referred to as the Malayan Silverstreak Blue. Recommendation : The species Iraota rochana boswelliana should be named Scarce Silverstreak Blue. However, for convenience and common usage, the "Blue" is likely to be left out. Again, time will tell which is the preferred name that will be more often used by the general community. The next species, Catapaecilma major emas is referred to as the Greater Tinsel by Dr Kirton. A related species, C. elegans was given the name Lesser Tinsel in the same book. Elsewhere in the region, reference books refer to C. major as Gray Tinsel and C. elegans as Common Tinsel in Butterflies of Thailand. 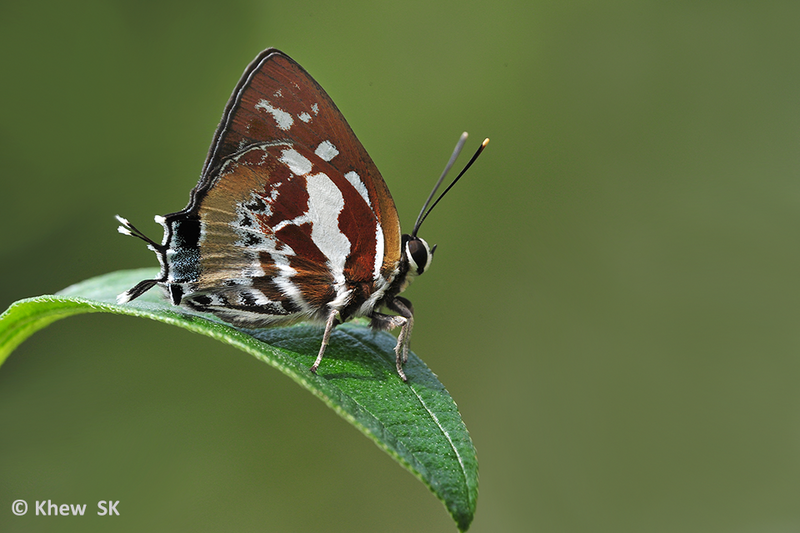 In his latest book, Isaac Kehimkar's Butterflies of India refers to C. major as Common Tinsel, as C. elegans is probably not found in India. Our local Singapore butterfly references refer to C. major as Gray Tinsel. Recommendation : It is not likely that the confusion across the region can be resolved in the immediate future. We recommend that the name Gray Tinsel be retained for the species Catapaecilma major emas until such time enough authors come together to have a common stand on the name of this species. 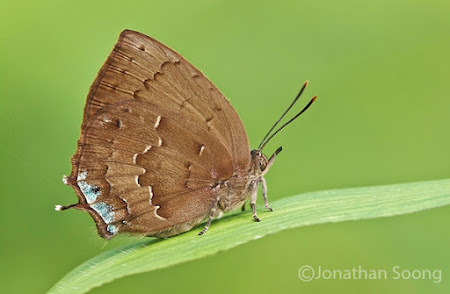 The final species of interest in this series of discussions on Lycaenidae is Horaga syrinx maenala. Dr Kirton calls it the Yellow Onyx. Several Indian references call it by the same name. 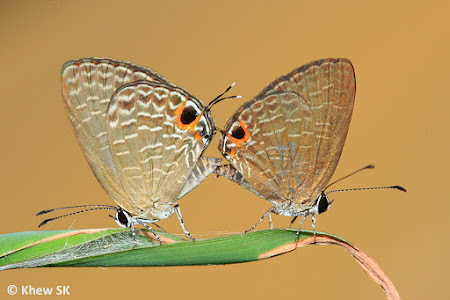 (However, the species is rare in India, and many hardcopy references do not feature this species). Pisuth refers to it as Ambon Onyx in Butterflies of Thailand. 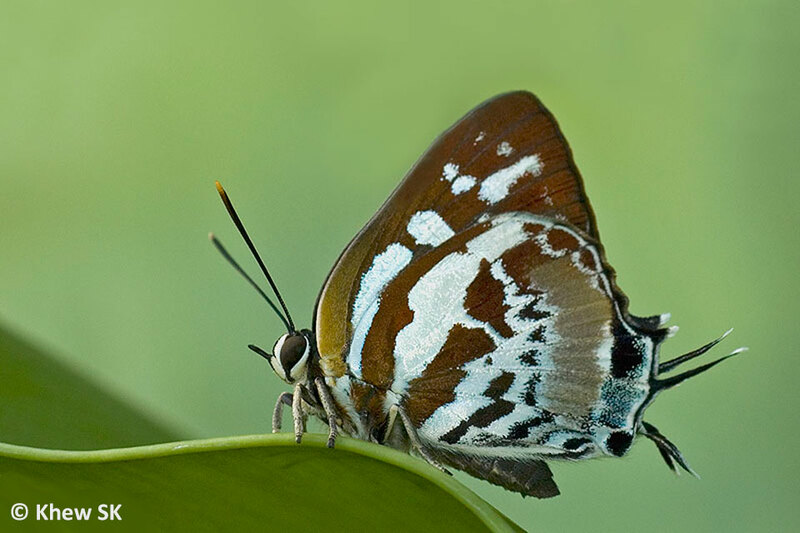 We have adopted the name Ambon Onyx for this species in Singapore references and the name has been regularly used in cyberspace. 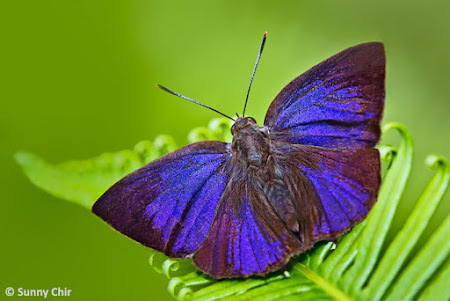 An online article from Bhutan, as recently as last week, calls this species the Ambon Onyx as well. Again, it does not appear that there is any common consensus on the English common name of this butterfly, and hence the jury is still out on the matter. However, through common usage, time will tell which of the two common names will be preferred by amateur enthusiasts. Recommendation : The name Ambon Onyx will be retained for the species Horaga syrinx maenala.